You have to love it when a company tries new things. Assassin's Creed was well received, for a Crusades-era murder simulator. The sequel jumped forward in time to the Italian Renaissance, which opened up a whole world of new possibilities. In fact, one of the early selling points for AssCree2 was that you got Leonardo da Vinci as your own personal Q (the James Bond version, not the Star Trek version). A highlight of the game's debut at E3 was the use of Leonardo's flying machine to gain access a target that was otherwise secure, but it turns out that was the only time it's actually used in the game - one brief segment. Still, that didn't keep NECA from turning it into a toy. Technically this isn't the first vehicle NECA has made, but it might as well be. A device for other figures to ride on, sold separately, is a whole new area of endeavor for the company - and they did a bang-up job for their first time. According to the packaging, the Flying Machine was sculpted by Thomas Gwyn - personally, I find that rather hard to believe. No one sculpted this thing: looking at it, it appears to be made from real wooden beams with cloth stretched across them. You can see the weave of the linen, the wrinkles on the cloth from where it was stored... the only way to convince your brain that it's not actual cloth is to touch it - any moment you're not in physical contact with the wings, your mind will revert to thinking of it as soft and maleable. 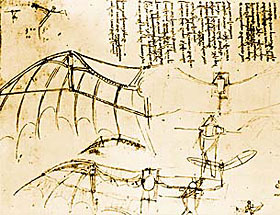 As much of a genius as he was, Leonardo did not understand flight: today we know that in order for heavier-than-air flight to be a reality, a wing needs an airfoil shape to create lift; air flows faster over the top than under the bottom, so the pressure is lesser above than below, and the wing is pushed upward. Leonardo thought of flight as a brute physical process, requiring you to claw your way into the sky by forcing air downward - aka "flapping." 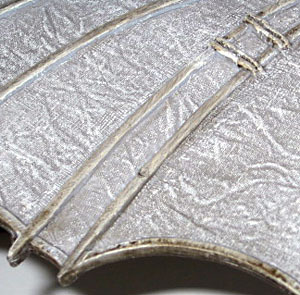 The wings of this Flying Machine are based on those of a bat, as were many of the studies recorded in his journals. The Flying machine needs to be assembled once you bring it home, but there are no instructions included. Fortunately NECA published directions on their website. It's a bit tough to get everything in place at first, but I must admit I was being extra careful, for fear something might break. The wings are hinged where they join the body, so you can position them either raised up or spread out. The struts that connect them to the frame attach via balljoint, which allows them to move slightly as you reposition the wings; the struts also extend to nearly twice their length (since there's no way a fixed length could accommodate multiple poses. The tail raises and lowers, as well. There are additional balljoints on the struts, but they don't seem to serve any purpose. We asked NECA, but no response yet. The flyer has a 24" wingspan, and is 11" from front to back. The underside of the machine has two frames to support its passenger: one in the front, large enough for a man's head and shoulders to fit inside, and a smaller one in the back where he rests his feet. 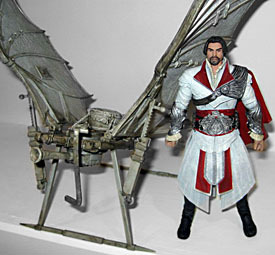 Knowing that this Flying Machine was coming is the only reason I bought AC: Brotherhood Ezio, because I wasn't sure the older figures would fit in. Ezio can hold the handlebar, but for the best posing option you'll need to pull his blades out of his sleeves: they get in the way otherwise. Be careful when moving the wings: eventually one of the pegs holding the frame under the body broke, and I've had to glue it, and it's never going to be as strong again. 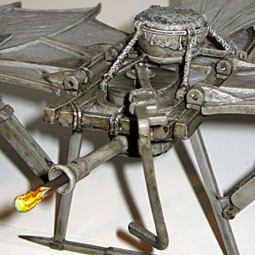 The Flying Machine also has some offensive weaponry. Right above the pilot's head is a cannon that fires flaming ammunition. Plug in the included missile, then press down on the handle to fire it. The gun can be aimed, to a degree: it swivels left and right, using the same clever handle that allows you to fire it. You can sort of get Ezio's hand on the trigger if you work at it, but it doesn't look very natural. The spring is strong, so it fires well. 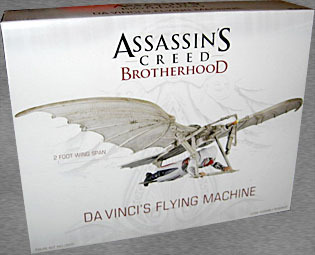 Da Vinci's Flying Machine is a Gamestop exclusive, which is rather bad news: yes, the store is fairly ubiquitous - there are four of them within five miles of me, including two right above each other in the mall - but the toy was offered as a preorder, and most locations didn't stock any extras. The nearest I could find in an actual brick and mortar location was two hours away! Fortunately, their website has very reasonable shipping - this is a fairly sizable item in a pretty big box, but it still only cost an extra $3 to get it delivered. Definitely beats paying eBay or Amazon prices! And yes, I checked the math first, using our online Gas vs. Shipping cost calculator. The Flying Machine may not seem a "vehicle" in the traditional sense, but remember that Hasbro used to sell the C.L.A.W. by itself, too. And besides, when was the last time you can think of a 7"-scale toyline having a vehicle at all? 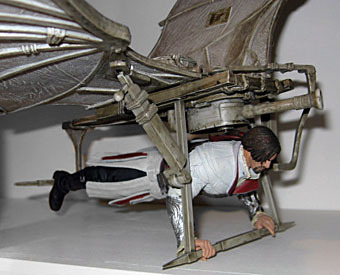 The Flying Machine looks great and is constructed pretty well, so if you're a fan of Ezio, it's worth tracking down.